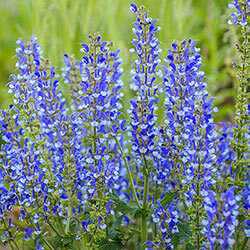 Salvia is an excellent option for a low-maintenance sunny border. It is drought tolerant once mature, although average watering practices produces optimal growth. 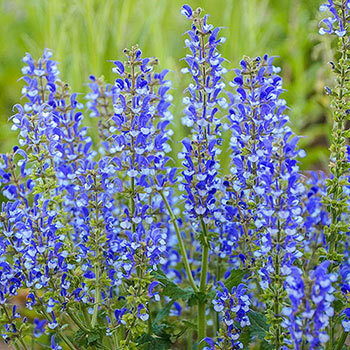 Azure Snow Salvia is a compact variety with cool light-and-dark bicoloring on its flowers. It is lovely repeated through the front row of a mixed perennial border. The blooms appear in multitudes along each stem, creating a little blue cloud above the fragrant, deep green foliage. Absolutely adored by butterflies and hummingbirds, so it'll be a particularly fun show from late spring to early summer with all those beneficial pollinators zipping through. 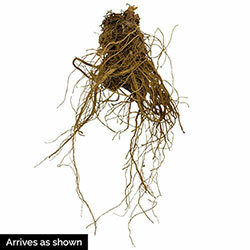 This variety is refreshing in cut-flower arrangements, or for longer lasting indoor decor, create a dried bouquet. Planting Instructions: Prefers full sun to dappled shade. Plant in an area where it will not receive excessive winter moisture.